LEADING IN: The Eagles and Panthers both came into 2013 with high expectations. Coconino had been slowly building themselves into playoff contention, going 5-5 in 2011 and 6-4 in ’12. 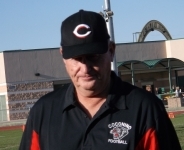 George Moate’s return to the sidelines brought a return to classic Coconino football: hard-nosed defense, running the ball between the tackles, and mistake-free quarterbacking. Flag High came into the season with a chip on their collective shoulder, having finished 2012 with an 8-2 record, but #17 in the AIA power rankings, just shy of the playoffs. Instead of complaining about being robbed by the AIA, they hit the weights hard in the offseason. A lot of seniors remembered when the Eagles went winless in 2010 and won just twice in ’11, and this was to be the year they put it all together. This year, there was no Page on the schedules, no Chino Valley, no Tuba City. Both teams had schedules featuring Top Ten teams. Flag High met their demanding schedule with good performance, going into the rivalry finale with a 5-4 record, but mistakes at the wrong time kept them from going from good to great. They were upset by Verrado, 33-30, after getting off to a big lead; the next week, they beat then-Top-Ten Prescott, 18-16, playing their best defense of the year. Their loss to Bradshaw Mountain was possibly their toughest; they had a chance to get a stranglehold on first place in Section IV, but by losing 37-3, they would be behind the Bears the rest of the season by virtue of head-to-head tie-breaker, even though they both had only one sectional loss. Led by the passing of senior Kyle Wilson and the running of Cody Philpott and Mike Salazar, their offense remained potent all season. Coconino’s schedule was not only brutal, they had an injury epidemic that crippled their season. They felt the effects right off the bat, having to deal with injuries during pregame warm-ups at the opener against Lake Havasu City. Nearly every senior who suited up for the Panthers either lost time because of injury, or played through them. It was so bad that, as the season was ending, Coach Moate was bringing up several JV players to fill the roster. Austin Herre led the team in rushing and had a couple of hundred-yard games, but his season was hampered as well by a nagging high ankle sprain. With last year’s starting QB Damian Alarcon transferring to D-I Valley Vista, passing duties were split between sophomore Cristo Tabaras and junior Jess Kuehl, often alternating series. All this led to a mediocre 1-8 record heading into their game against Flag High, and while the Panthers had a tough season, their seniors were semi-healthy for maybe the first time all season, and they had upset on their minds. THE GAME: A sign of the times could be seen at the opening coin toss; while the Eagles sported roughly the same four captains who started the year against Central, two of Coconino’s went to the field in plain clothes, including perhaps their best all-around athlete, Travis Walters, who had been out since Week 3. The Eagles wasted no time in establishing control. Less than four minutes into the game, Wilson hit Dylan Mathews for a 55-yard catch-and-run, and with Trace Anderson’s extra point, Flag High quickly went up 7-0. Tabaras started for the Panthers, who started on offense with the sincere intent to ram the ball right down the Eagles’ throats. Runningbacks Ray Crank and Austin Herre ran hard, breaking tackles and dragging Eagle defenders, moving the ball and gaining first downs. But their drives stalled by the time they got to the red zone. Flag High struck again as the second quarter began as Wilson hit Mathews again for a score, this time from 33 yards out. On the following kickoff they pinned the Panthers back deep in their end. As Tabaras dropped back, he was hit from behind Flag High defensive end Marvin Otenyo, jarring the ball loose, which Eagles D-Lineman Gabe Matus scooped up and ran in from five yards out. Just a minute and a half into the second quarter, the lead had grown from seven to 21 points, and the Panthers were on their heels. Coconino continued with their game plan, and they were successful between the 20’s, but they simply could get no closer, despite Herre running his tail off. Anderson kicked a chipshot 19-yard field goal with about four minutes left in the half to put the Eagles up 24-0. That was pretty much it for the game. The Panthers defense stiffened from that point on, and they continued to run and tackle hard, but they simply had no steam. Kuehl took over for Tabaras and was no more effective; between the two of them, they combined for seven completions and 61 yards. In the final seconds, with the Eagles in scoring position, Coach Eddie Campos told Wilson to take a knee and kill the clock. As a team, Coconino ran for 113 yards, almost all of it between Herre and Crank. That was about the same amount as the Eagles, who ran for 118 yards. It was Wilson’s passing, though, that broke the Panthers’ back early, especially the strikes to Mathews. Wilson finished with 206 yards through the air, 173 of them to Mathews. At the end of the game, the first Cromer Awards since 1976 were presented. Austin Herre won the award for the Panthers, while Cory Chavez was named the Most Outstanding Eagle. AT THE END OF THE DAY: Despite the high expectations from recent successful seasons, neither team made the playoffs. Flag High had their best chance at a postseason appearance in years, but with being so senior-heavy this season, 2014 may be considered a bit of a rebuilding year. As for the Panthers, the plague of injuries that decimated the seniors may turn into a blessing for next year, with so many underclassmen gaining valuable varsity experience. As for the rivalry, the Dome is slowly starting to fill, with better attendance this year and more media attention around town. While the overall results are still fairly even (Flag High now leads the series 24-21), it must be said that the Eagles have won eight of the last nine Duels in the Dome, the longest such run in the rivalry’s history, including the last three in a row.